The Nyaya sutras cover a wide range of topics, including Tarka-Vidyā, the science of debate or Vāda-Vidyā, the science of discussion. 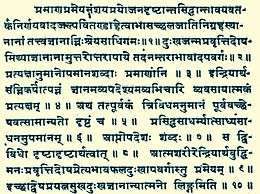 The Nyāya Sutras are related to but extend the Vaiśeṣika epistemological and metaphysical system. Later commentaries expanded, expounded and discussed Nyaya sutras, the earlier surviving commentaries being by Vātsyāyana (c.450–500 CE), followed by the Nyāyavārttika of Uddyotakāra (c. 6th–7th century), Vācaspati Miśra's Tātparyatīkā (9th century), Udayana's Tātparyapariśuddhi (10th century), and Jayanta's Nyāyamañjarī (10th century). The Nyaya-sutras is attributed to Gautama, who was at least the principal author. According to Karl Potter, this name has been very common Indian name, and the author is also reverentially referred to as Gotama, Dirghatapas and Aksapada Gautama. Little is known about Gautama, or which century he lived in. Scholarly estimates, based on textual analysis, vary from the 6th century BCE, making him a contemporary of Buddha and Mahavira, to as late as the 2nd century CE. Some scholars favor the theory that the cryptic text Nyaya-sutras was expanded over time by multiple authors, with the earliest layer from about mid-first millennium BCE that was composed by Gautama. The earliest layer is likely to be Book 1 and 5 of the text, while Book 3 and 4 may have been added last, but this is not certain. 2 20 How to analyze opposing views, presents its theory of five membered arguments, correct conclusions are those where contradictions do not exist, theory of reasoning methods that are flawed, what is a quibble and how to avoid it. 2 50 Presents correct knowledge is necessary and sufficient to destroy defects. Both whole and part must be known. Establishes external world exists, and phenomenon are as real as objects. Refutes "the everything is false" theory. Presents ways to produce and maintain correct knowledge, Need to seek and converse with those with knowledge. 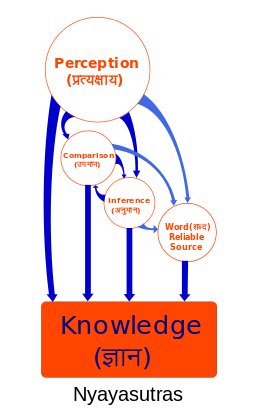 Nyayasutras defines inference as the knowledge that follows or derives from other knowledge. It always follows perception, states the text, is a universal relation or essential principle. One form of inference is a Purvavat, or translates Fowler, "from cause to effect or a priori". Thus, if a path or road is wet or river is swollen, states the text, then "it has rained" is a valid knowledge. The sutras assert that the "universal relationship" between the two is necessary for correct reliable knowledge, that is "if in all cases of A, B is true then one may correctly infer B whenever A is perceived". Further, there is a causal relation between the two, whether one knows or not of that cause, but inferred knowledge does not require one to know the cause, for it to be valid knowledge, states Nyayasutra. The text states one must not confuse coexistence as universal relation, that while deduction and induction both are useful and valid means for gaining true knowledge, it lists rules when this method can lead to false knowledge. The theory of doubt, according to the Nyayasutras, starts with the premise that doubt is part of human learning process, occurs when conflicting possibilities exist with regard to cognized object. Doubt is neither error nor absence of knowledge, but a form of uncertainty and human struggle with probability when it faces incomplete or inconsistent information. It is a knowledge that is possibly partially valid and partially invalid, but doubt is a form of knowledge that has positive value. Doubt is an invitation to "proceed to further investigation", asserts the text. All four means of knowledge (perception, inference, comparison and testimony) discovery may be useful in this investigation, but doubt is both a psychological state and a means to knowledge, not in itself a valid knowledge state the sutras. The Nyayasutra defines error as the knowledge, opinion or conclusion about something that is different than what it really is. Gautama states in the text that the error is always in the process of cognition itself, or the "subjective self", and not in the object. It is the duty of the knowledge seeker to "test the validity of his knowledge", both in assumptions or through practice (experience), but neither the object of knowledge nor the knowledge itself is responsible for errors, only the knowledge seeker and his process of cognition is. The Nyaya theory shares ideas found in the theory of errors found in Advaita Vedanta, Buddhism and Mimamsa schools of Indian philosophies, states Rao, and these schools likely influenced each other. The Nyayasutras dedicate many sections on causality and casual relations (Karana, Sanskrit: कारण), particularly Book 4. Causes, in Nyaya view states Fowler, are "antecedents of their effects invariably and unconditionally". A specific effect is produced by a specific cause (plurality in causes accepted), and in Nyayasutras view a specific cause produces a specific effect and no other (plurality in effect, or contradictory effect is not accepted). The sutras assert that there cannot be reciprocity to a cause, either we misunderstand the cause or misapprehend the effect. The text rejects remote or supernatural causes, and rejects that qualities are causes. The text asserts that causes are immediately antecedent, causes exist before an effect in time, and to know something is to understand the effect and the specific cause(s). The text recommends yogic meditation in quite places such as a forest, cave or sandy beach in sutra 4.2.42, that the knowledge seeker should purify one's soul by Yamas, Niyamas and spiritualism of yoga in sutra 4.2.46. Meditation is a treasured and recommended practice in the text, and extensively discussed by Nyaya scholars that followed Aksyapada Gautama. Vatsyayana wrote in his commentary on Nyayasutras, for example, that meditation is that which enables the mind to contact one's soul, which is accompanied by a conscious eagerness to get at the truth, and such meditation is an essential practice to gain true knowledge. Numerous other commentaries are referenced in other Indian historical texts, but these manuscripts are either lost or yet to be found. Starting around 11th- to 12-th century CE, Udayana wrote a primary work, that built upon and expanded the theories on reason found in Nyayasutras. Udayana's work created the foundation for Navya-Nyaya (new Nyaya) school. The Hindu scholar Gangesa of 13th- or 14th-century, integrated the Gautama's Nyayasutras and Udayana's Navya-Nyaya work, to create the influential Tattvacintāmaṇi text considered a masterpiece by scholars. 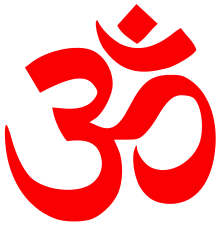 ↑ Francis Clooney states, "Nyaya is the traditional school of Hindu logic. In the early centuries BCE the Nyaya logicians undertook the project of describing the world in a coherent rational fashion and without reliance on revelation or a commitment to any particular deity. Nyaya's primary text, the Nyaya Sutras of Gautama, can be read as a neutral analysis neither favoring nor opposing the idea of God". ↑ Nyayasutras' 3.2.10–17 present its argument against Buddhist "momentariness of everything", while sutras 4.1.37–40 challenge the "voidness of everything" premise of Buddhism, sutras 4.2.6–4.2.11 question its "whole is not separate from parts" premise, and sutras 4.2.26–37 present its refutation of Buddhism's "denial of objects and observed reality" premises. ↑ Like other schools of Hinduism, the Nyaya school holds the premise, "Soul exists, and Soul (or self, Atman) is a self evident truth". Buddhism, in contrast, holds the premise, "Atman does not exist, and An-atman (or Anatta, non-self) is self evident". Buddhists do not believe that at the core of all human beings and living creatures, there is any "eternal, essential and absolute something called a soul, self or atman". ↑ Jeaneane Fowler (2002), Perspectives of Reality: An Introduction to the Philosophy of Hinduism, Sussex Academic Press, ISBN 978-1898723943, page 129; Quote: "In focusing on knowledge and logic, Gautama's Sutras made no mention of Vedic ritual". ↑ White, David Gordon (2014). The Yoga Sutra of Patanjali: A Biography. Princeton University Press. pp. 194–195. ISBN 978-0691143774. ↑ Anatta, Encyclopedia Britannica (2013), Quote: "Anatta in Buddhism, the doctrine that there is in humans no permanent, underlying soul. The concept of anatta, or anatman, is a departure from the Hindu belief in atman (“the self”)."